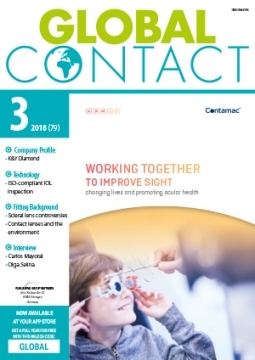 GlobalCONTACT is an international magazine with editorial focus on contact lenses and IOL supplemented by technical articles from the view of the contact lens industry and also from the view of the contact lens fitting specialists. Already years ago the editorial volume was adjusted of IOL and took on its permanent place in our magazine. Articles about business and management, association work of European and international associations are an inherent part of GlobalCONTACT as news concerning research and development. GlobalCONTACT is printed in English and has 2.700 subscribers worldwide. EUROMCONTACT 2018 market data report on sales of contact lenses and lens care products in 31 countries is now available! CooperVision has acquired Blanchard Contact Lenses, Inc.